Whether you're feeling hungry at meal times, feeling sleepy during late night hours, or feeling awake every morning...all of these are normal and natural behavior of all living things. The mechanism that controls these physiological activities of the body is called the “Circadian rhythm”. It is also known as the “biological clock” or “body clock”. 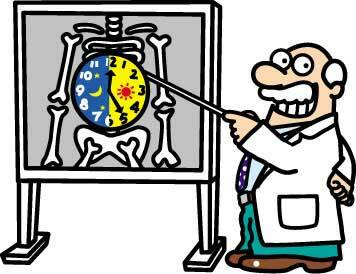 Not only people, but animals, insects, trees, flowers, including bacteria, have this kind of biological clock (Circadian rhythm) within them. We believe that the main part of this body clock is coming from within the brain where the signal waves are being received and sent. 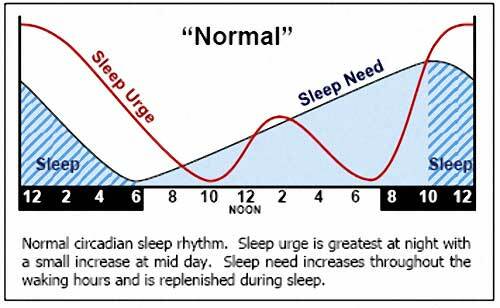 Circadian rhythm refers to the cycle of activity over the course of a day. The word “circadian” is formed from Latin words circa meaning “around” and dies meaning “day”. The circadian rhythm is responsible for making you feel awake in the morning, or feel sleepy in the evening. How Does Your Body Clock Work? Your body uses signals like daylight and activities to find out if it's day or night. A tiny region on the brain called the suprachiasmatic nucleus (SCN), situated just above the optic nerves, is responsible for getting information of whether it is day or night. The SCN also controls melatonin production, which regulates your sleep-wake cycle. Since your body clock relies on external factors like light and darkness, several things can interrupt the SCN, such as blindness, jet lag, and people working at night, which can lead to sleeping problems. The earth completely rotates in 24 hours, but the period of our body's internal circadian clock has been said to be about 25 hours—a difference of 1 hour. Scientists were able to find this by putting people indoors with no time cues for a long period of time. Eventually, their bodies naturally adjust to a 25-hour day rather than 24 hours. Meaning to say, if we were to live in complete darkness (like in caves), we would fall into cycle of days that last up to 25 hours. In fact, the body clock of people who are blind is set to a 25-hour cycle since they are unable to receive signals in the form of daylight exposure. That is why blind people often have problems with sleeping. Why this is so is unknown, but this explains why traveling from east to west is much easier as our body's internal circadian rhythm is 25 hours, so we can adapt quickly to this time zone change. Our biological clock influences how our bodies change throughout the day—our blood pressure, blood flow, blood clotting, and other processes in our bodies. Therefore, the time of the day surgery is performed or a medicine is taken may be vital to successfully treat diseases. In fact, we have reports that cancer patients treated with chemotherapy at a proper time, which corresponds to patient's body clock of 7:00 PM, experienced considerable improvement in their health. It was also reported that diabetes patients who were given medicine at their body clock time of 7 PM were cured in just a few days. Also, obese or overweight women who followed proper eating time according to body clock were able to lose weight. I myself eat breakfast at 6 AM, lunch at 12 noon, and dinner at 7 PM. I don't eat anything at all after 7 PM. No work and no overtime, but just rest. It is according to my body clock, and it makes me feel fine and healthy. Doctors somewhat believe that people have various health problems because we are not following our lifestyle according to our body clock. Studies show that there is a right time to sleep, a time to wake up, a time to eat, and a time to take medicine. By following them accordingly, you may be able to extend your lifespan with good health condition. Since I try to follow my lifestyle according to my body clock, I don't find things that go wrong with my work, business, hobbies, and health. Begin adjusting your daily routines according to the time of your body clock. This will lead you to have a successful life in every angle.